Apologies for the lack of activity around here over the last month; members of the writing team have been away overseas on vacation, and sometimes the bell of relaxation tolls far too loudly. However, rest assured that How To Invest In Gold is going to be cranking back up again in the coming days and months. First on the list of important additions is going to be an RSS feed, which means you will easily be able to subscribe to our latest updates and commentaries. Next, there will be the exciting inclusion of in-depth gold and silver investment guides covering both physical and ‘digital metals’. We will also be further exploring the complex and weighty issues of inflation, and how you can protect the purchasing power of your money. Gold acts as inflation hedge, which also goes a long way to explain why we are so in favor of the yellow metal. Because it cannot just be created out of thin air; because there is a finite supply, gold is always going to retain some form of intrinsic value. The same cannot be said for paper/fiat currency, which can practically be generated in unlimited quantities. Whilst gold is not guaranteed to perform well during inflationary periods, the general consensus (and historical precedent) tends to suggest that it does hold purchasing power and increasing in value when pressured by inflation. However, inflation is not the sole cause of gold price increases, and this must be kept in mind. At the end of the day though, gold does serve as one of the most potent inflation hedges available. It has its foibles, but has proven itself a time trusted and tested form of currency over thousands of years. Unless someone with the Midas touch happens to pop up and start turning everything to gold, it is always going to retain an intrinsic value of some degree. This is, of course, a very complex and difficult issue to understand completely. The best way to get your head around gold and hedging against inflation is to read further into detail on the subject. Golden Bull, recommended by the Gold Standard Institute, is the ideal way to learn more about how gold works to protect your income from inflation. 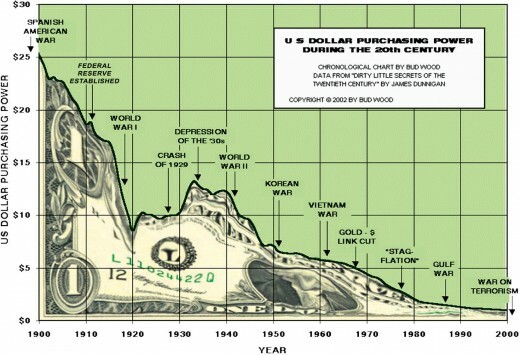 For the majority of the 20th Century, the United States dollar existed as the world’s sole reserve currency. Gold and silver were eschewed for ‘Benjamin’s', and the synthesis of a global superpower was complete. 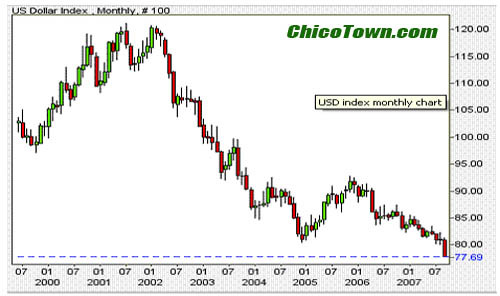 The US dollar became the only real way to purchase important commodities such as oil. Printing of dollars could go on with reckless imprudence for the simple reason that the Petro-dollar system, and America’s virtual monopoly on military power, provided a backing platform. Hardly pleasant viewing for anybody with a vested interest in the dollar. Which is everybody, because that is the currency that almost every commodity is priced in. Ever wondered why fuel, food, clothing etc are getting more and more expensive. The above picture tells you why. Further misery for the dollar. Fun times. And we haven't even got to the current financial crisis yet. There you have it folks, the miserable worth of a dollar over time. Au revoir Mr Greenback, you have been a good friend, and we wish you all the best in the afterlife of reject, worthless currencies. One of the greatest benefits of the Internet is the ease with which it allows one to purchase things. Want to buy a new computer? Order it online, and have it shipped to your door. Purchasing insurance? This can easily be done over the World Wide Web too. Today you are going to learn how to buy physical gold online. Because there are so many different ways you can purchase precious metals over the Internet (and there are many pitfalls you need to be wary of) this guide will be indispensable to you. Is the website you are going to purchase from reputable and safe? There are a lot of ‘cads and bounders’ lurking on the Internet. Therefore it pays to be as sure as you possibly can be that you are buying from a reputable source. Purchase from big websites that offer encrypted security for buyers, delivery from a trusted postal service, as well as offering customer support so you can get in contact over the phone or by email before committing to a purchase. Avoid shady looking websites, or ones that offer deals which are too good to be true. If you are being offered physical gold below spot price then proceed with caution (unless you are buying from a reputable website, or an official mint website) Remember that if a deal is too good to be true, then it probably is false. Purchase from official mint websites. Companies such as the NZ Mint offer competitive pricing, quality products, and safe and reliable service. Most countries have an outstanding mint that offers the same. Coming in the next couple of days is a follow-up post about buying gold online through ETFs, and other ‘digital gold’ options. This is a completely different kettle of fish to deal with, and therefore deserves its own detailed posting. In the time being, we suggest you take a look at Golden Bull, which is our in-house gold and silver investment guide. It offers unbeatable information, advice, and analysis for beginner, intermediate, and advanced precious metals investors. You cannot get this information anywhere else in the world, so you need to get your copy of Golden Bull today. Apart from the ‘living under the rocks’ brigade, most of us are now aware of the serious problem inflation poses on an already extremely fragile economy. With poor employment and growth figures, there is very little leeway for increasing prices and decreased purchasing power. Rising petrol/gas prices alone pose a serious threat to any form of economic recovery that may be on the not-too-distant horizon. To be blunt, we are sick of inflation, and sick of discovering that everything one would want to buy on a regular basis seems to cost more and more. Although house prices, electronics, and car prices may be falling (or at least remaining fairly constant) it is the little things in life that demonstrate the crippling powers of inflation so well. Food prices have soared over the past decade. Transport costs are through the roof. Energy, heating, and clothing all cost far more than they once did. In order to help you comprehend inflation, its causes, its consequences, and potential solutions, we at Caerleon Publishing will be putting lots of energy into inflation-related material. There have already been a few posts about this issue, as well as how you can use precious metals to safeguard you from inflation. Golden Bull, our very own precious metals investment guide offers masses of information about inflation and protecting yourself from it as well. We have also started a new dedicated section on this website, entitled ‘Protecting Savings From Inflation’, which will become the focal point of insight and analysis into inflation, as well as how you can use precious metals and other ‘tools’ to protect your income and purchasing power from this tempestuous force. Check it out know and enlighten yourself further on the subject of inflation – just click the text link above, or the permalink at the top of the page. Also, keep coming back to How To Invest In Gold this week, as we have a few big posts in the pipeline that are sure to whet your appetite for gold and silver investment advice and tips. Activity has a been a bit lacking over the past week, but we will more than make up for all that. In todays post you are going to learn how to buy gold for investment. There is going to be no clever trickery of words involved, not fudging of the lines- this is a straightforward and simple guide to purchasing gold as a investment that will hopefully yield you profit, and shield you from the ravages of inflation. Set your budget first. Just because gold is gold, and therefore has tangible and physical properties unlike shares you shouldn’t be lured into thinking that it is ‘safe’. Relatively safe, yes. Failsafe? No. If you are new to investing in gold then don’t set a budget of more than what you can feasibly afford to lose. If you have plenty of cash put aside then you will have a bit more leverage, but you shouldn’t throw everything behind gold. Decide how you want to invest. Now you have your budget set, the important step of deciding exactly how you want to invest comes about. You can either invest in physical coins or bullion, or purchase some form of ‘tradeable’ digital gold. Investing in precious metals stocks and leveraged trading will come later, as will playing the gold/silver ratio. When starting out we highly recommend using an investment platform such as Bullion Vault, where you can buy and sell proven gold grams. If your budget was $1500, for example, you could afford maybe one ounce of physical gold. However, for that same amount of money you can have a lot of gold grams to play with. If you are really convinced that inflation is about to take off, or that currency collapse is on the horizon then physical gold may still be a better first time investment. Congratulations- you have bought yourself some gold. Now what? You can take the ‘long view’ and hold your gold as a safeguard against inflation. Historical precedent suggests that in the long run your investment will increase as the value of paper currencies fall. Even if there are crashes and dips along the way, the long term prospects are good. This is a highly recommended approach if you hold physical gold with the intention of protecting your purchasing power against inflation. You can try and sell the highs and buy the lows with your gold. This is going to be the easiest if you use a platform such as Bullion Vault. If you are successful then you could see the value of your investment increase rather rapidly. The basic steps of buying gold for investment really aren’t that intimidating at all. Provided you have some money with which to play, and you are not doing anything crazy like mortgaging your dog to raise funds, investing in gold is a fantastic way to hedge against inflation and potentially make a healthy profit. Just remember- Do not borrow money to invest in gold or silver. This is asking for trouble. For more about investing in gold, click here. Nobody likes having the purchasing power of their money gradually eroded. Or, in the case of hyperinflation, nobody likes having their purchasing power disappear in mere hours. That is why you must protect yourself against the ravaging tempest that is inflation. Fiat currencies are, when all things are boiled down, worthless. It is the promises of politicians and central bankers that provide the backing for the money most believe to be immortal. The wise man built his house upon the rocks. The foolish man built his house upon the sand. Only the ‘banksters’ and politicians could build a house upon nothing of any value whatsoever. However, gold and silver can be used to provide protection against inflation. In times of currency collapse these two precious metals have proven themselves time and time again valuable allies of whoever wishes to preserve their purchasing power . Holding both physical and ‘digital’/note of ownership metals will provide you with leverage in the event of inflation. Although in the event of total currency collapse ala Weimar Germany physical metal will quickly become your best friend. But you already knew that gold and silver are your friend when it comes to protecting against inflation, right? The real question should be why are precious metals good at safeguarding your purchasing power, when many other investments are not? Gold and silver are finite resources that have an extremely limited supply. You cannot just print more gold or silver. You cannot create more of either out of thin air. They are both useful for purposes other than being money. Bank notes and cash cards serve no other purpose than acting as a medium of exchange- their intrinsic value is nil. Gold, on the other hand, can be used in jewelery or electronics (or in the engine bay lining of your Mclaren F1, if you have expensive tastes) Silver is an important industrial metal too. When inflation occurs, it is because there is more ‘paper’ currency floating around in the system. More dollars means higher prices, if the amount of goods produced cannot keep pace with the increase in the supply of money. However, you cannot just increase the supply of gold and silver magically. Therefore, the value of these two metals increases when inflation goes up. It’s basically a simple case of value. In the event of a currency collapse, when you experience hyperinflation, people abandon faith in a fiat currency and reject it completely. Because paper currency is how we think of money, people will still continue to use it, except larger and larger quantities are required in order to be able to purchase goods and services. Think Zimbabwe. In a situation such as this, gold and silver simply skyrocket in value as they are tangible goods which hold their value. An ounce of gold could go from being worth as much as a crummy second-hand car, to the value of a Ferrari overnight. It has happened before, and will happen again. So now that you know why you need gold and silver, it’s time to learn how to invest in the precious metals. From the ever-informative and entertaining website Zero Hedge, we bring you today’s update of jaw-dropping insanity. Just look at the following image, which depicts the rise in commodity prices and other important sundries since the US Federal Reserve ventured forth from the 7th circle of hell. So there is the evidence- the creation of an institution which is able to print currency at will has inflated the price of almost everything by mindblowing proportions. No amount of clever verbiage could sum up such a twisted image. Just another reminder why you must hold gold.